NEW CO2 REFILL STATION FOR BEER,TEA AND AQUARIUM KEGERATORS. YOU CAN REFILL YOUR KEG CO2 TANKS FROM ANY PAINTBALL STORE OR LARGE 55LBS CO2-SIPHON TANKS. DUAL VALVE CO2 FILL STATION FOR BEER,SODA,BREWING,HYDROPONICS, WELDING,TEA AND AQUARIUM KEGS Now you can refill your co2 tank at any paintball store or use any 55lbs anti-siphon large co2 tank. Easy installation/Video available. 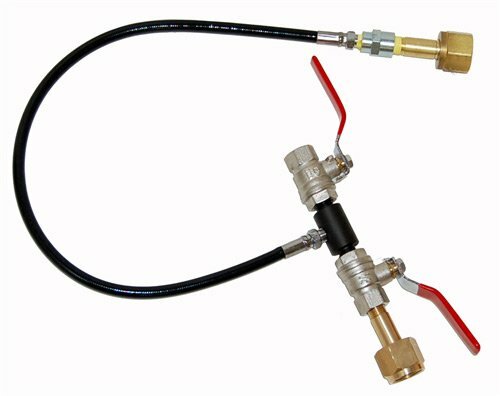 This fill station connector is CGA-320 (STANDARD FOR CO2 INDUSTRIAL TANKS) 36 Inch Hose Heavy Duty Tank Connector Dual Heavy Duty 1/4 Turn Valves Heavy Duty Fill Valve W/On/Off This is a Co2 fill station for filling small and large CO2 TANKS. Don't settle for the single valve fill stations which require you to use the bulk tank valve to fill your tanks. This fill station has 2 quarter-turn heavy duty ball valves for filling, so it is faster and much easier on your hands than the single valve fill stations. This is the fill station that the professional CO2 stores owners use all across the country. Turn this into a money maker by filling Co2 tanks for profit. You can easily charge $25 per fill of a 5lb CO2 keg tank which is a profit of about $20 per fill. This will pay for itself in no time at all. Filling tanks is safe and easy. All you will need to do is rent or buy the proper (syphon) bulk 50 pound CO2 tank from your local welding supply store. If you have any questions about this product by Trinity, contact us by completing and submitting the form below. If you are looking for a specif part number, please include it with your message.